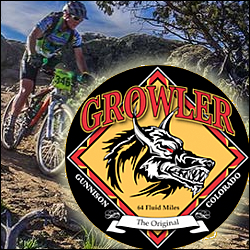 The Original Growler race event takes place near Gunnison Colorado in May. The single track ride is presented by the Gunnison Trails organization, and is only for experienced riders! NO BEGINNERS. Trails and terrain are difficult and very challenging to negotiate and this requires a very experienced mountain biker only. Register early as this ride fills up quickly – helping support the Gunnison Trails so please be comfortable in making a donation on behalf of this great non-profit organization.